In a medium bowl combine the first five dry ingredients and mix well. In a separate medium bowl combine the almond butter and eggs, mixing until smooth. Mix in the coconut oil, followed by the chocolate syrup. Add the dry ingredients gradually to the almond butter mixture, mixing until fully combined. Press the “batter” into a greased 13″ x 9″ pan to an even thickness. Should be about 1/2 an inch thick. Bake for 15 minutes at 350 degrees (F). Remove from the oven and cool. For the caramel: Combine 1 1/2 cup smooth almond butter with 6 Tbsp Torani or Davinci brand sugar free caramel flavored syrup, and 2 tsp of stevia or splenda. Mix well and press onto the cooled brownies. 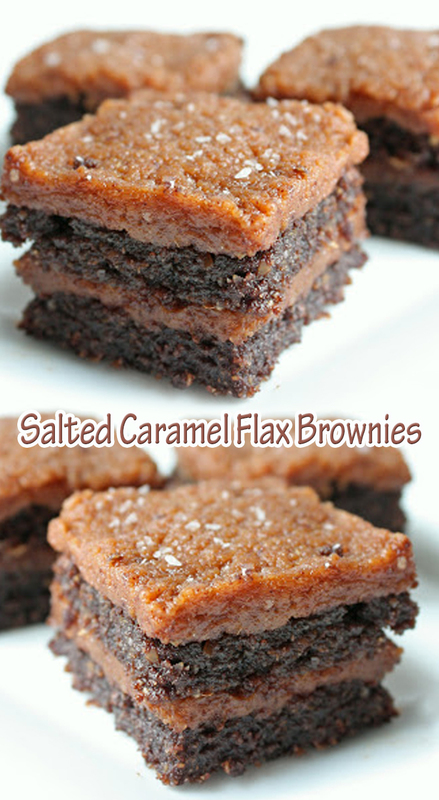 Cut into squares and press one on top of the other for a total of four layers per brownie. Sprinkle with kosher or sea salt.